Since 1979, Universal Accounting Center® (UAC) has recognized the need for specialized hands-on visual online small business accounting, bookkeeping & tax training. 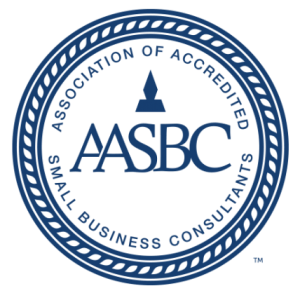 We are a Better Business Bureau accredited online Accounting School and we help thousands of individuals get the skills, experience and credentials it takes to advance their accounting careers, start and grow their own accounting, bookkeeping and/or tax businesses, as well as expand their existing business offerings to include more value based services to help them become Profit & Growth Experts. 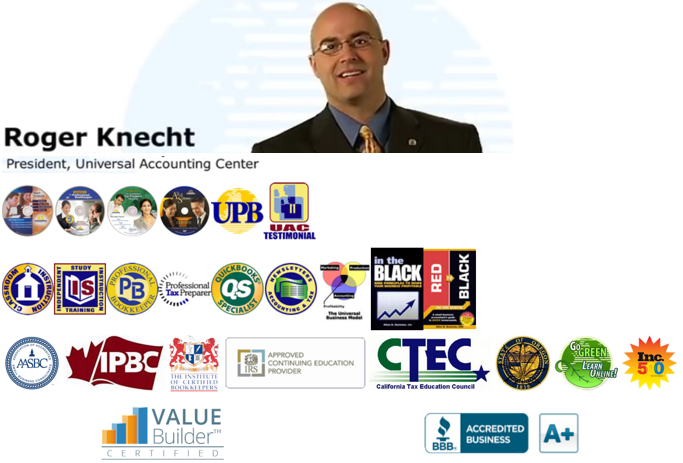 Universal Accounting’s programs are delivered through convenient, online video tutorials. You set the pace and manage training around YOUR schedule. You’ll have access to continual resources and support from experienced accounting professionals – even after you finish and are working in the field. Most of the programs are designed so that the Training & Certification can be completed in just 3-6 weeks. Universal Accounting is a unique post-secondary school. We have different choices in training and tuition options that other schools don’t offer. We are proud to know our courses are usually more affordable than other program as individuals look for the training and certifications to excel in their careers or start and build their firms. Let us customize a program around your needs VS. a school telling you what you need. Call UAC today and speak with a representative that will listen to understand your present situation, your background and goals before recommending one or more of our guaranteed programs. 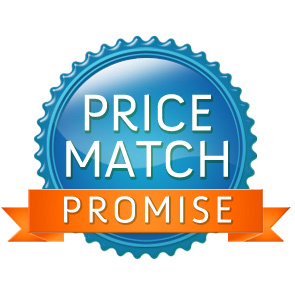 Universal will price match any other schools pricing. The competitor’s training has to be identical to the UAC’s training. Must have proof. (website, etc.) Example: Training has to come from a school. Not a company. 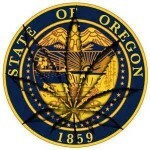 IRS approved, Books, taxes, enrollment fees, video format, support, etc. Call 801-265-3777 to qualify. Click on the image above to take the quick, 1-minute video tour of Universal Accounting Center (UAC). Check out the curriculum and performance improvement tools developed to help you become a qualified accounting professional and to help both you and your clients reduce taxes, increase profit s and build savings. Also, follow us on Facebook to stay current on related topics – here is our Universal Fanpage, we look forward to seeing you there. Know this, if it’s about accounting it’s Universal. In fact, Accounting Success IS Universal! Four years ago, Shannon Beck was working long and stressful hours as a headhunter – recruiting CPA’s, Controllers and Bookkeepers for Robert Half International. He spent a great deal of his time in traffic and rarely saw his family. Because of the increased stress, lack of sleep, long hours, and on-the-go eating habits, his doctor told him that if he continued to live this way he would die by the age of 40. Becks’ wife, Tina, had opened her own bookkeeping firm, Beck Accounting Services, in October 2004 and had turned to Universal Accounting to help her run her business more successfully. After seeing the growth his wife had gained from Universal Accounting, Beck saw an opportunity to help his wife grow her business, and recognized that he would have more time to spend with his family. Beck took a chance and joined her, after consulting with Universal Accounting’s management. “The main reason was I never saw my family,” he said. On June 1, 2005 Beck left his corporate job to become an entrepreneur with his wife. He spent a great deal of his time working on the sales and marketing side of their business, helping his wife bring in several new clients. Within 5 months, they made more money than he had earned at his previous job. 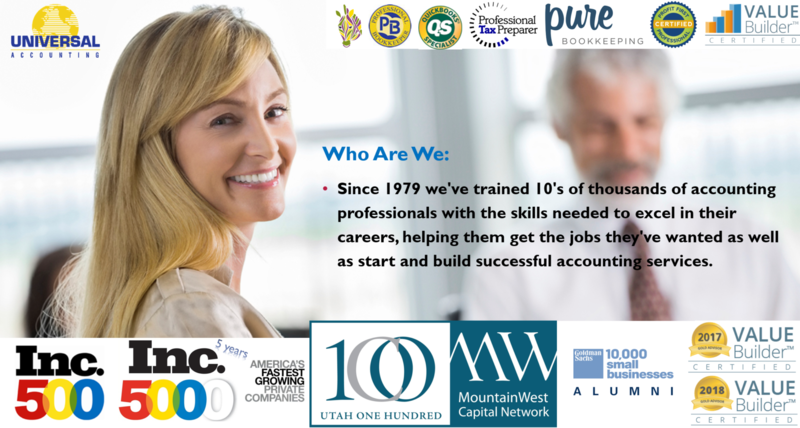 Despite taking accounting classes at BYU, Beck also graduated from Universal Accounting as a Certified Professional Bookkeeper. “It helped me to really understand how to be an accountant,” Beck said, explaining that the several college classes and experience as a finance manager, didn’t give him all the knowledge he needed, or the support. Beck continued to train to be a full-service accountant, and again chose to enroll in the Universal Accounting Practice Builder Workshop. “It’s a fantastic tool,” Beck said. “It gave us the knowledge and tools to run and operate an accounting firm for small and medium sized businesses.” He testified that the program not only showed them how to get the company, now called Professional Accounting Solutions, up and going, but how to organize and run it. 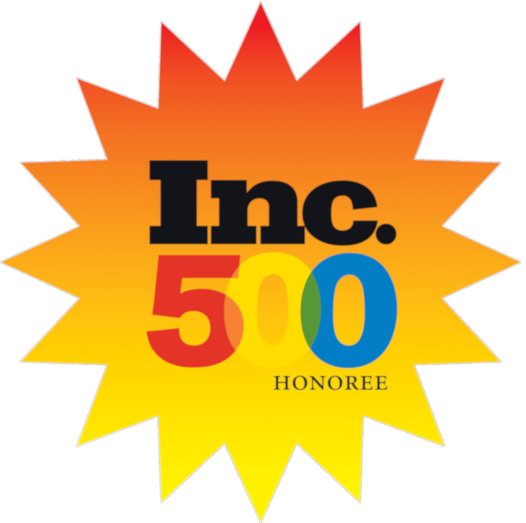 “After five years, Universal Accounting is still working with us today,” he said. As past students they can still ask questions and get help from the company at any time.